Rising demand from diverse end-use industries such as automotive, aerospace, biomedical, robotics, etc. is driving the market growth. Owing to excellent properties such biocompatibility, pseudoelasticity, non-corrosive, high damping ability, shape memory effect, and high fatigue life are boosting the demand of SMA. Growing usage in fire safety and protection system is again boosting the market growth. Ongoing Technological advancement in alloy formation and the wide variety of alloy available are presumed to add impetus growth to the market in the following years. The latest report by Value Market Research expects the Global Shape Memory Alloys Market to reach USD 70.4 billion by 2025. It was valued USD 29.9 billion in 2018. The report foresees a 13% CAGR from 2019 to 2025. In 2018, Nickel-titanium dominated the product segment by accounting major market share. Robust demand from biochemical industry for the production of surgical instruments, medical devices, implants, rods, wires, films and etc. is driving the segment market. Apart from biomedical, rising demand from other potential industries such as automotive, consumer electronics, etc. are also pushing the segment growth uphill. 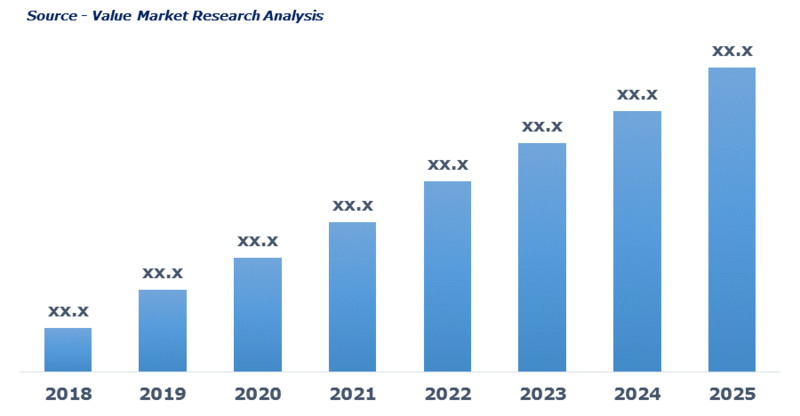 By application, medical sector emerged as the leading segment in 2018 owing to rising application of SMA in medical devices, implants, and equipment. The growing prevalence of chronic and fatal medical conditions has generated high demand for implants and devices to enhance patient care are further boosting the segment growth. On the basis of region, North America dominated the market in 2018. Booming aerospace, automotive, healthcare, and other end-use industries are driving the regional shape memory alloy market. Increasing spending on research and development and application especially for the aerospace industry is again factor fueling the market growth in North America. ATI Wah-chang, Baoji Seabird Metal, Dynalloy, Fort Wayne Metals, Furukawa Electric, G.RAU GmbH & Co. KG, GEE, Grikin, Johnson Matthey, Metalwerks PMD, Nippon Seisen, Nippon Steel & Sumitomo Metal, Nitinol Devices & Components, PEIER Tech, SAES Getters, Saite Metal, Ultimate NiTi Technologies are the key manufacturers of the shape memory alloy market. As per this study the Global Shape Memory Alloys Market was valued USD 29.9 BN (by revenue) in 2018 and is anticipated to reach USD 70.4 BN by 2025 with a CAGR of 13%. The shape memory alloys are alloys that regain their original form even after deformation. They are lightweight and act as an alternative to the conventional actuators, such as motor-based, pneumatic, and the hydraulic systems. Owing to the exceptional characteristics of the shape memory alloys they have application across different end-user industries. Rising demand from the end-user industries such as aerospace & defense, consumer electronics & home appliances industries, and the healthcare sector owing to its superior property is expected to drive the market growth. The increasing use of the shape memory alloys in the safety and security systems, manufacturing of the golf clubs, and anti-scalding protection are again driving product demand. Owing to their exceptional characteristic like shape memory effect, pseudo-elasticity, and high damping they find electronic and medical applications. Technological advancement and broader availability of alloy are assumed to add impetus growth to the market in the near future. This detailed market study is centered on the data obtained from multiple sources and is analyzed using numerous tools including porter’s five forces analysis, market attractiveness analysis and value chain analysis. These tools are employed to gain insights of the potential value of the market facilitating the business strategists with the latest growth opportunities. Additionally, these tools also provide a detailed analysis of each application/product segment in the global market of shape memory alloys. The broad shape memory alloys market has been sub-grouped into product and application. The report studies these subsets with respect to the geographical segmentation. The strategists can gain a detailed insight and devise appropriate strategies to target specific market. This detail will lead to a focused approach leading to identification of better opportunities. Furthermore, the report comprises of the geographical segmentation which mainly focuses on current and forecast demand for shape memory alloys in North America, Europe, Asia Pacific, Latin America, and Middle East & Africa. The report further focuses on demand for individual application segments in all the regions. The report also covers detailed competitive landscape including company profiles of key players operating in the global market. The key players in the shape memory alloys market include ATI Wah-chang, Baoji Seabird Metal, Dynalloy, Fort Wayne Metals, Furukawa Electric, G.RAU GmbH & Co. KG, GEE, Grikin, Johnson Matthey, Metalwerks PMD, Nippon Seisen, Nippon Steel & Sumitomo Metal, Nitinol Devices & Components, PEIER Tech, SAES Getters, Saite Metal, Ultimate NiTi Technologies, and others. An in-depth view of the competitive outlook includes future capacities, key mergers & acquisitions, financial overview, partnerships, collaborations, new product launches, new product developments and other developments with information in terms of H.Q.